Since its formation in 2003, JTU has gained an unrivalled reputation for providing a full range of high-quality products to the region’s electronics manufacturing industries. In 2015, JTU has grown to release affordable premium own brand products. As a distributor for the world’s renowned brands of PCB assembly and SMT equipment, we are totally committed to customer satisfaction, by providing practical, innovative and cost effective one stop solution with comprehensive training and timely technical and spare parts support. We train our staff towards excellence. As a market-driven and customer-oriented company, we seek to form close ties with our principals and customers so that, they view us as a valuable partner. Together with these partnerships, we have a shared interest in seeing each other prosper. Our aim is to become the most distinguished provider of the lowest cost of ownership; highest productivity; finest post sales service supplier in our region, to assist our customers to remain competitive in this rapidly evolving electronic industry. JT Universal Pte Ltd was established in Singapore and we become the first company to represent JT, a China brand lead-free reflow & wave-solder machine in South East Asia market. JTU Thailand was established in Bangkok. JTU Malaysia was established in Penang and Melaka. Started GKG printer distribution in South East Asia market. Paid-up capital was increased to S$250,000. Created more than 100 active customers in South East Asia. Moved into our own JTU Singapore HQ Office & Training Center. JTU Indonesia was established in Jakarta. JV company “GKG Asia Pte Ltd” was incorporated in Singapore with GKG China to distribute their SMT printer worldwide. Started an exclusive business partnership with Juki USA to distribute JT & GKG products in the North America market. Started an exclusive business partnership with Juki Europe to distribute JT & GKG products in the Europe market. JV company “Anda Automation Pte Ltd” was incorporated in Singapore with Anda China to distribute their conformal coating machines globally. 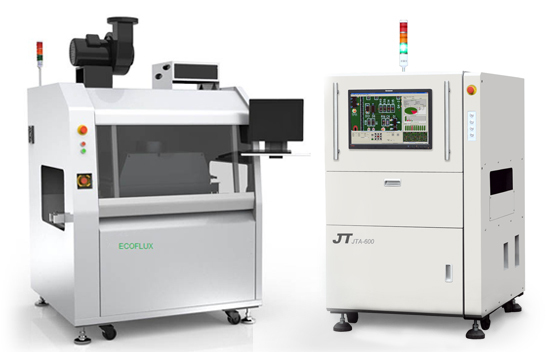 Our own JTU premium brand RS-eco series reflow oven and HCZ series vertical oven were launched. JV company “KED Tech Pte Ltd” was incorporated in Singapore with KED China to distribute their stencil and PCB cleaning system globally. Our company was renamed to “JTU Pte Ltd” and our official website became jtugroup.com. Partnership agreement was signed with Panasonic Factory Solution Asia Pacific to supply them with our JTU brand RS-eco series reflow oven. JTU had acquired 80% of “Anda Automation Pte Ltd” shares and it was renamed to “JTU Automation Pte Ltd”. Our own JTU premium brand jCOAT series conformal coating “OMO” line was successfully launched. “GKG Asia Pte Ltd” became a subsidiary company of GKG China with the acquisition of 51% shares by GKG China. JTU new industrial building will be ready at “ECOWORLD Industrial Park II” near Senai Airport Johor Malaysia. Machine showroom and training center catered for the global market will be established.